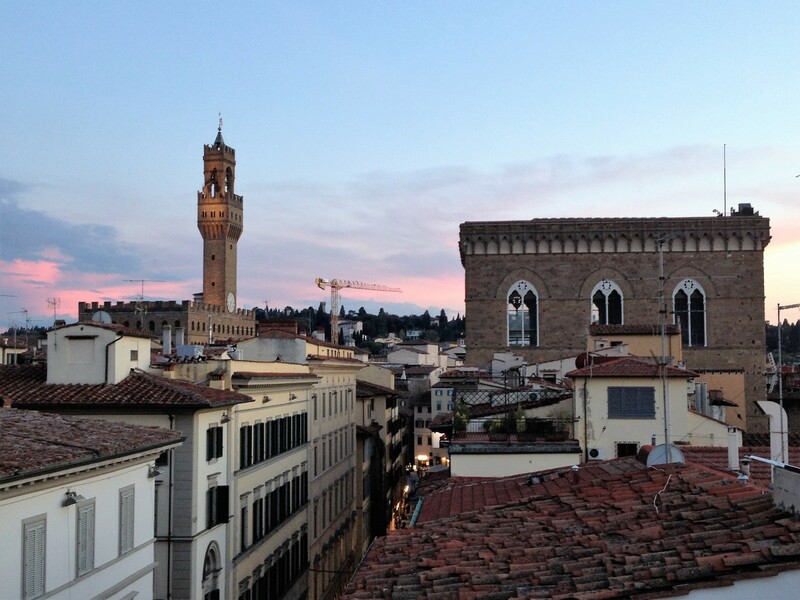 Finishing in Florence | Sprezzatura, Y'all! I can never seem to finish writing about my trip. The last couple of days get away from me. Maybe because I’m trying to engage all my senses to remember every last detail. Maybe because the last day or so is consumed with packing, repacking, buying another suitcase for all the little things you’ve been picking up along the way, and repacking again. Maybe because I’m just too damn sad to sit down and write about my last few experiences simply because they are my last few experiences. Regardless the reason, I never finish. I’ve been back five days and still haven’t finished that last day. There is no doubt that my muse is somewhere in Italy, hovering around waiting on me to return, which I always do. It does not follow me across the ocean and back to Atlanta. But, alas, all the many Sprezzatura, Y’all fans out there have been clamoring for me to finish so they won’t be left hanging with what happened on our last magical day. OK, one person asked me to finish. So here’s the final recap. Monday morning we got up and got moving. We had to say our goodbyes, turn the rental car in, and get to the train station in Arezzo. We were planning to take the bus to Arezzo, but Livio wouldn’t hear of it. He insisted on following us to the rental car place and then driving us to Arezzo. This should have been fairly straightforward, but this being Italy, it wasn’t. The rental car place recently moved (as in over the weekend – this was their first day operating in this location) and their credit card machine was not hooked up. So we had to pay in cash. Of course, we didn’t have that much cash. And then there was the issue of the gas tank. It was supposed to be turned in full, but it was only 3/4’s full. We we just going to pay for the extra gas, but that’s not how it works at this place. They would have to charge us for another whole day. So off we went to fill up and find an ATM. Sounds easy, no? The gas was no problem, but the ATM was a different story. They don’t have them all over the place in Italy like we do in the US. Not at the gas station, not at the grocery store. We had to drive to Sansepolcro to a bank. OK, we did that, but there’s a limit on how much you can withdraw and between us and Livio, we couldn’t get enough to cover the bill. Back to the rental car place. Livio was going to send someone from Busatti back down there later with the cash and we would just pay them back. Very nice of him. But when he told the woman at the counter this, she said that wasn’t necessary. We could just wire the money to them when we got back to the US. Can you imagine? I’m sure it’s because we were with Livio and they know each other, but how nice of her. So we were off to Arezzo. We got to Florence in about an hour, arriving just in time for lunch. The apartment we rented was about six blocks from the train station and we decided to walk instead of paying for a cab. With our four suitcases. Over the cobblestone streets. Through the throngs of tourists. In the 85 degree heat. We arrived and met Massimo, the owner of the apartment. He explained that the cleaners had not been yet and we couldn’t go in just now. He kept our luggage secured for us and we went off to have lunch. Steve was a little hesitant to leave all our stuff with this man we didn’t know and had already paid for an apartment we hadn’t seen. But I reminded him we were in a country where a woman let us walk out without paying for a two-week rental car. was the loft bedroom with a queen bed. Very cozy. Then up another flight of stairs was the private roof terrace. Wow. The view was incredible. 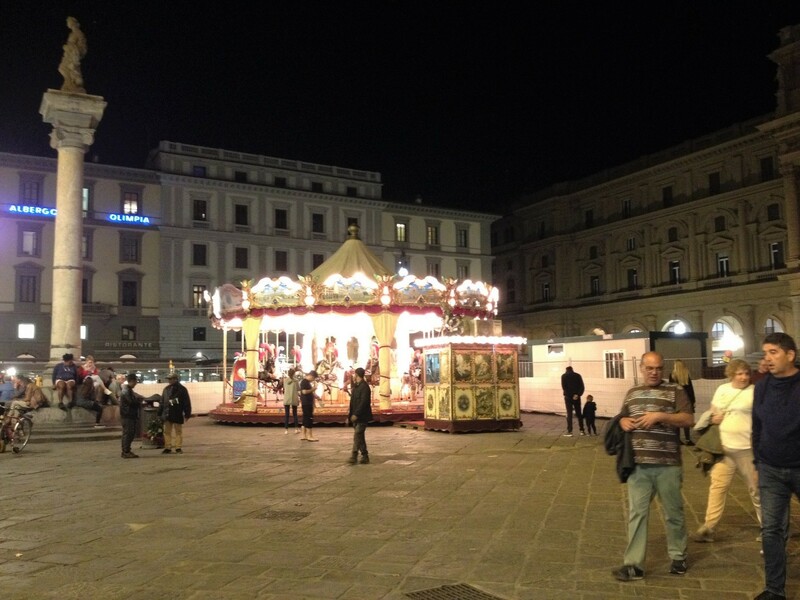 This apartment is on the street that runs between the Duomo and the Piazza Signorella. So the view to the left was the great dome and bell tower and the view to the right was the Palazzo Vecchio. The view straight ahead was the rooftops of Florence and the mountains in the distance. We didn’t want to leave. We were really torn between just hanging out in the amazing space or walking around one the greatest cities in the world. So we did both. We walked around for an hour or so, then came back and shared the bottle of wine Massimo gave us on the roof. We decided we should have one last meal, so we consulted one of my trusted food apps and went to a tiny little trattoria a few blocks from the apartment. We had a wonderful meal in a quirky little place with the funniest chairs ever. We strolled back to the apartment and made our way to the roof to spend our last few hours feeling the breeze and gazing at the subtle lights of Florence. We had to get up very early the next morning, so we reluctantly went to our little sleeping loft and slept our last night in Italy. Well, we mostly slept. We left one of the windows open a little because it was a little stuffy in the apartment and the late night/early morning sounds of Florence jolted us awake a few times. There was an air conditioner in the apartment but we couldn’t figure out how to use it. If we ever stay there again, we will definitely get the instructions on that. Massimo arranged for a cab to pick us up at 7:00. At about five till we got a text from Massimo saying the cab was on the way and should be there by 7:00. And it was. Really nice service. At that hour, traffic was a breeze and we got to the airport with plenty of time to spare. Our flights back were all just fine, except I was in the middle seat between two strangers from Paris to Atlanta. It wasn’t so bad. The woman in the window seat never once moved. And the woman in the aisle seat got up a few times and I got up when she did. And then we were home. The memory of that sweet little apartment has stayed with me all week. And I hope it stays with me forever. What a wonderful way to end this trip. 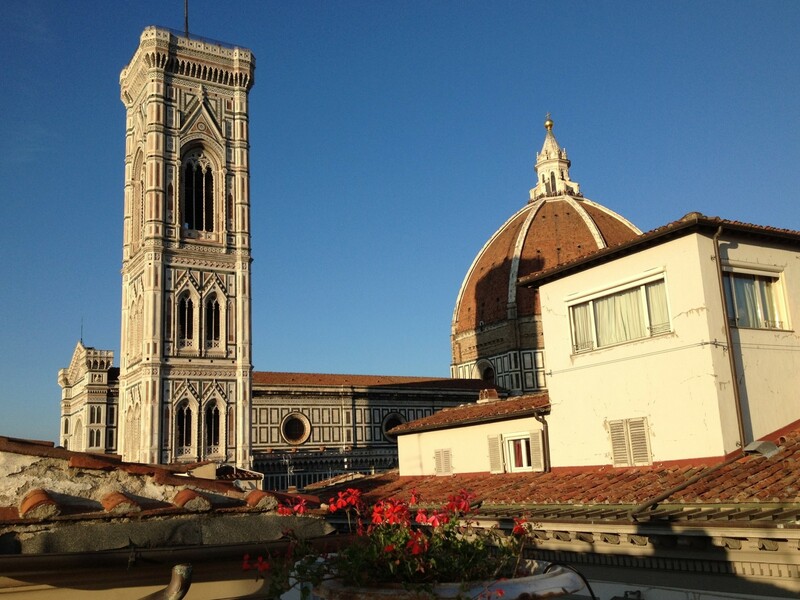 We’ve never stayed in Florence before – we usually stay up the hill in Fiesole. While there are pros and cons to both, for this one, last night staying in town was perfect. It made us want a little more, but was such an amazing way to end everything that we weren’t too awfully sad about leaving. OK, I’m lying now. We were the saddest people in the world. But we always are when we have to come back. We’re so very grateful that we can make these trips and have these experiences that enrich us in so many ways. Now to start planning the next one. Holy Mother! What a meal, by the time you got there you needed it. Yes – we were quite hungry! And that’s just what we needed.